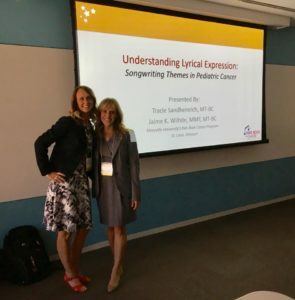 Kids Rock Cancer music therapists Tracie Sandheinrich and Jaime Wilhite recently had the opportunity to present at Chicago’s Adler University, as part of the Institute of Therapy through the Arts’ third integrated creative arts therapy conference. The Creative Arts Conference, held June 8 and 9, gave professionals utilizing the creative arts therapies an opportunity to connect and learn about clinical work, research, training, and community identity. Kids Rock Cancer’s two-hour presentation to fellow creative arts therapists and counselors focused on the development and programming of Kids Rock Cancer and the therapeutic songwriting process. “This was an amazing opportunity for us to not only talk about Kids Rock Cancer’s impact in the St. Louis area, but also to advocate and educate other therapists outside of the music therapy profession about our mission,” Tracie says. The presentation was developed from Jaime’s nearly 15 months of research into “Understanding Lyrical Expression in Pediatric Songwriting,” completed as part of her master’s degree program. Her strict analysis of song lyrics randomly selected from the Kids Rock Cancer database gave conference attendees an inside look at the common themes and content of songs being written by children facing the challenges of cancer. The Kids Rock Cancer team hopes to continue spreading awareness about its music therapy program and also continue this research with future participants. This entry was posted in KRC News. Bookmark the permalink.